The furry member of our family has a love-hate relationship with dog beds; she loves to dig them until they explode. This sweet-looking, 12 pound professional digger destroyed several beds a year. And, for some reason, it seemed like the more expensive the bed, the quicker the trip to the trash can. Looking for a better solution, I noticed that the fleece blanket with the tied edges I made to drape over her favorite spot on the couch hadn’t really shown any wear after a year’s worth of use (she digs on it, too). So, I went to the fabric store and bought 2 yards of fleece on sale. I cut out a pillow shaped size and trimmed and tied the edges almost all the way around. 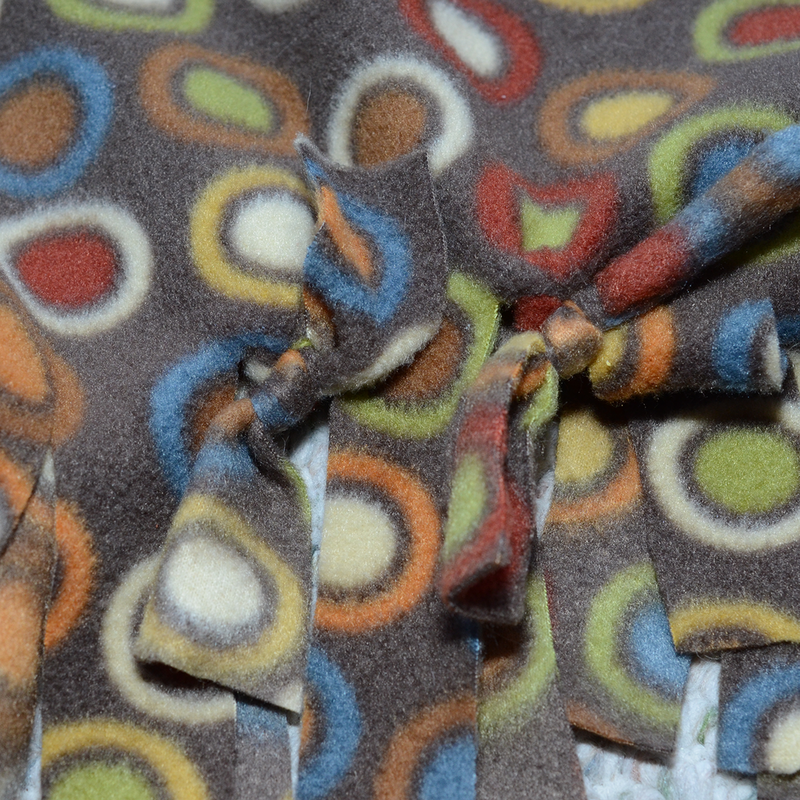 Then, I stuffed the inside with pillow stuffing (fiberfill) and tied the rest of the strips to seal it shut. I was careful not to stuff it too full so that when she lays on it a nice, natural nest effect occurs. She has been digging on this pillow for well over a year now and it is the only bed she's ever had that lasted this long. And definitely the cheapest bed I've ever purchased (under $20 and less than an hour's worth of time). I don't know if it is the lack of seams or that it is hard to grab hold. All I know is that if your dog digs through beds with little regard to your wallet, I'd at least give this method a shot. I should point out that she is a digger, but not a chewer. I decided to make a second one for my office. View below for pictorial instructions. *UPDATE* At some point, my dog discovered how to pull the stuffing out and thought it was great fun to throw it all over the family room. So I untied one end, removed the poly-fil, and threw in an old bed pillow. She didn't notice the difference and my floors are now fiber free. Step 1. Gather pillow stuffing, fleece and sharp scissors. You don't need five pounds of stuffing, that is just what I had on hand. You also don't need spring scissors, however they make the process faster and your hands will thank you. Step 2. If your dog is nosy like mine, now is the time to eject her from the room. Step 3. Trim the edges all the way around so they are even. Step 4. Cut a square out of each corner. I use the length of the scissor blade as my guide. Step 5. Trim strips an inch wide all around the matching the height of the square you cut earlier. Step 6. Tie the knots almost all the way around, leaving a 6 inch section untied so you can stuff. Step 7. Stuff. Tie the remaining knots. Step 8. Let the dog back in the room to dig on her new bed.